This Way North's Leisha and Cat both grew up in rural areas in Victoria. They are passionate about exposing students to the wonderful and creative world of music. Leisha is a fully qualified teacher with experience in both primary and secondary teaching having worked in some of the leading public schools in Melbourne. Cat runs booking agency The Booking Stable, who look after several artists and venues. She has a wealth of knowledge and experience from over 10 years in the music industry as an artist and agent. They present workshops designed to engage, encourage and inspire the next generation of musicians. They offer a range of sessions that will allow students to gain skills and knowledge of how to create songs, become independent musicians and the importance of self-expression. This workshop can be tailored to both junior and senior students and delves into the basics of creating a song. It will involve some instructional work but mostly facilitating the song writing process allowing students to get actively involved in creating a song. It can also be tailored to cover Live Effects Pedal Looping. This workshop will be focused on teaching students about women in music, the history, the current state and the bright future. It will involve discussions, video clips, strategies to get more women into music and feel empowered when they are there. Facilitating song writing processes and allowing students to get actively involved in creating a song focused on 'Women in Music'. This will cover the ins and outs of being an independent musician and how to go about getting started. The tools, strategies needed to approach venues, recording studios, media and publicity. A get started in the music industry kit. "An engaging workshop giving students and staff a “hands on” experience in creating compositions using looping pedals. Cat and Leisha from “This Way North” are fantastic musicians, role models and facilitators that inspired and the students to create their own song in just 60 minutes. 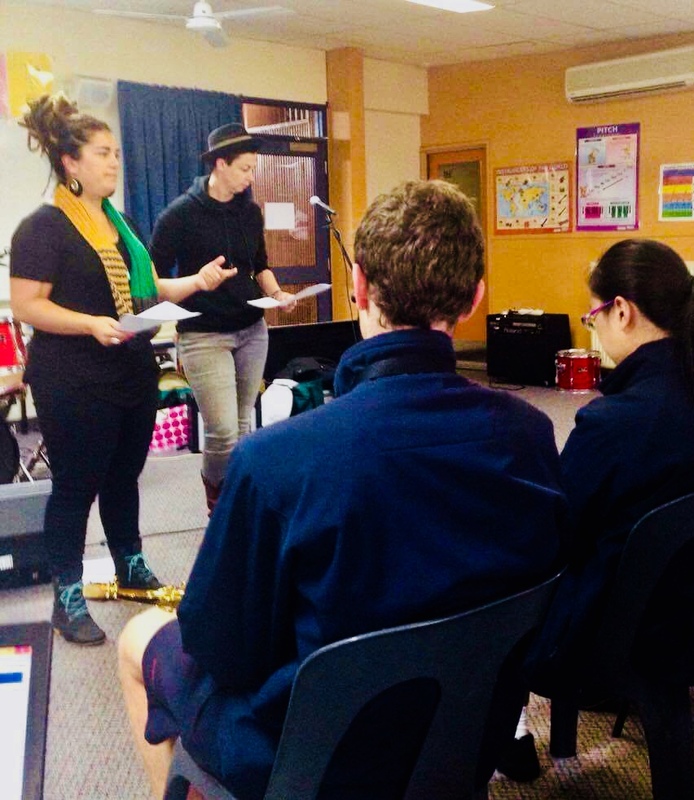 The workshop helped students to be inspired to create their own compositions using their recital pieces as starting points for VCE Music Performance Unit 2 outcome 4. Looking forward to inviting “This Way North” back for next year!" "I felt that this workshop taught me more about the process of composition regarding modern music. It also taught me more about the different us of equipment to make your composition better in addition to the phrasing of lyrics in music rhythms." "I found that the composition workshop helped teach me more about the work and the steps that go into making music. I also felt it became more accessible and was surprised at how quickly we managed to compose a simple song with the help of the band members and through teamwork. I also enjoyed learning about the other different ways to play music through the use of technology such as the loop pedal."